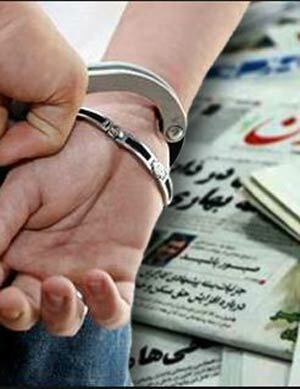 The last two days witnessed a new round of court summons and arrests of media and civil activists in Iran. Mashaollah Shamsolvaezin (a prominent journalist and member of Association of Iranian Journalists) was summoned and banned from leaving the country, Reyhane Tabatabai (another journalist and former reporter for pro-reformist Shargh newspaper) was arrested and sent to Evin prison, Saba Azarpeik continues to be kept incommunicado for more than a month, and Mehdi Khazali (a prominent critic of the excesses of the Iranian government who made headlines when he said that former president Ahmadinejad had Jewish roots) was also arrested again and taken to Rajaishahr Prison in Karaj. Months earlier, Khazali himself had said that a new judicial case against him had been filed by the prosecutor of the city of Isfahan on charges of disturbing peace and insulting officials. He said this was the thirteenth judicial case against him but added that this case had not been investigated at the initial stages but was sent directly to the court. Mehdi Khazali had earlier also said that the trial for the new case had been set for February/March of this year, for which he did not go to the court and instead had submitted a petition to identify the plaintiff. Khazali has been sent to prison six times since the disputed 2009 presidential election and has gone on a number of hunger strikes while incarcerated. Another journalist Reyhane Tabatabai was sent to the women’s ward after her arrest to serve a six month sentence on a new case. She was found guilty for “engaging in propaganda against the regime,” a charge based on her membership in the national youth headquarters during the 2013 presidential elections, participation in a gathering of young reformists in the town of Shahr-Kord, making trips to the provinces of Sistan and Baluchistan, and Gorgan and also insulting Saeed Jalili and Mohammad-Bagher Ghalibaf (both presidential candidates in 2013) on her Facebook page. While a 200 million Toman (about $60,000) bail was issued for her release a few days ago, she was still sent to prison to serve the remaining six months term from her previous conviction. She also has two prior arrests, one in 2010 and then in 2012, both times of which she was released on bail. Speaking to Iran’s ISNA student news agency about his arrest, Shamsolvaezin said, “I received two summons this morning, the first from the court in Evin requesting that I make myself present within the next three days to provide explanations, or face an arrest warrant. The second does not clarify who is the issuer, but announces my ban on leaving the country, adding that I could go to court within the next 20 days to protest the ruling.” His latest arrest was related to the 2009 election when he had been banned from leaving the country as well. That ban had expired last year. The situation with Saba Azarpeik’s arrest remains in limbo and she has had no contact with her family members since her detention since her detention on May 28th. Her mother posted a note on her Facebook page that she had been warned and threatened not to engage in talking or disseminating news over her daughter’s detention which otherwise would jeopardize her daughter’s situation. According to Saba’s mother, the charges against her are propaganda against the regime. Saba was arrested on May 28th and officials have contacted the family once to tell them about the detainee without providing any explanation as to why she was detained. She had been arrested along with 18 other journalists last. Her mother explained that when they stormed into their house that time, they slapped her son while video filming the whole episode, and then took her away in front of her eyes. “I want to tell the authorities that this is not the way to treat young people. Prison is not the solution and it will have the opposite effect,” she said.